Classic Broccoli Casserole is a comfort food staple! This side dish is great or holiday’s or weeknight meals. Full of fresh broccoli, cheese, and topped with Ritz! We have just passed our 3 year blog anniversary, you guys! Wahoo! 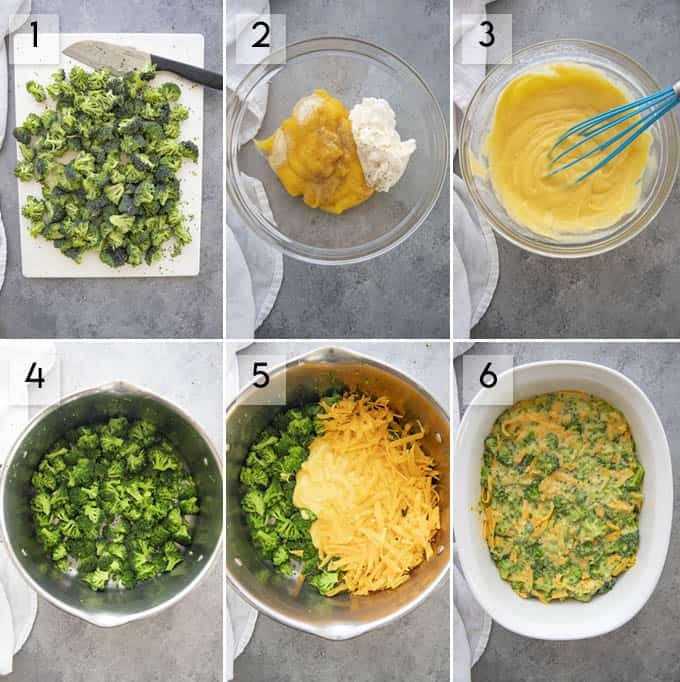 I couldn’t let another Easter, or Thanksgiving, or…..you get the idea go by without posting my classic broccoli casserole recipe. I’m from the midwest and these types of side dishes are something we grew up on, and all still crave as adults. While I typically save this one for the holiday’s, it’s easy to put together and great with almost any meal. If you’re looking for a couple more side dishes to go with your Easter dinner this year, definitely try out my Roasted Carrots, and these amazing Cream Cheese Mashed Potatoes! I’d say that everybody makes this a little differently, so let me give you my version! We use fresh broccoli florets, that have been briefly boiled for about 3 minutes and then drained. Please feel free to use frozen broccoli that has been thawed instead. 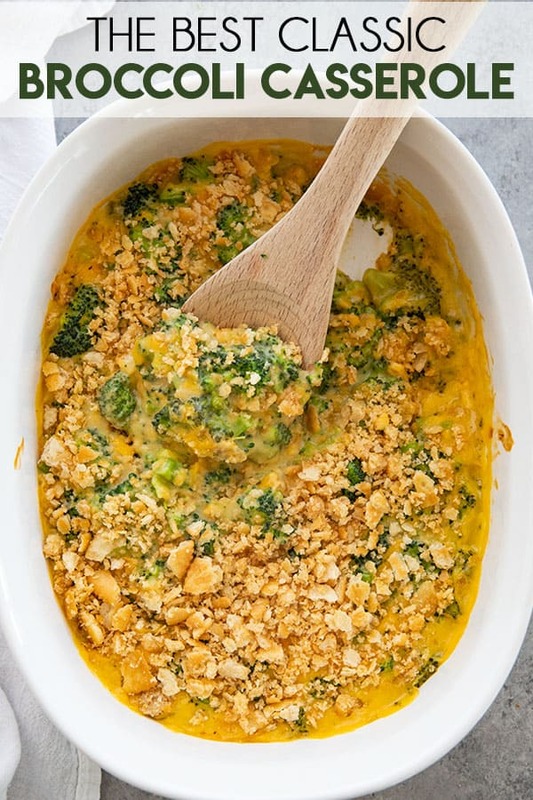 The broccoli is then stirred together with a mixture of cream of chicken or cheddar cheese soup, if you like things extra cheesy, mayonnaise, cheese, and seasonings. Don’t scoff at the mayo, it doesn’t overpower the casserole and adds a nice creaminess! We top our casserole with buttered Ritz crackers, and on occasion we use French fried onions just like on my Green Bean Casserole. Chop your broccoli on a large cutting board into bite sized pieces. Don’t cut them so small that they break apart completely. Bring a large pot of salted water to a boil. Add your broccoli, boil for 3 minutes, then drain and set aside. While the broccoli is cooking, mix together the cream of chicken, mayo, and seasonings in a large bowl. Whisk the milk into the soup mixture until smooth. Add the soup and milk mixture to the broccoli and fold to combine. 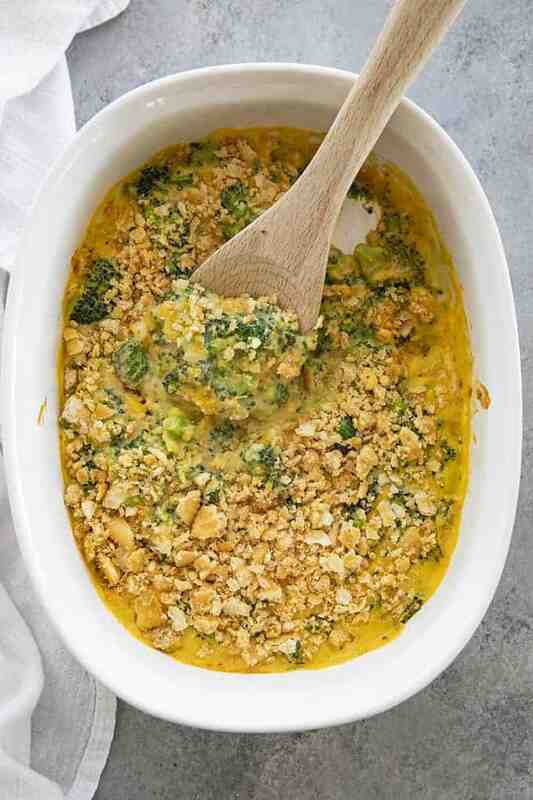 Spread the broccoli mixture into a greased 2 quart casserole dish and bake for 15-20 minutes until hot and bubbly. While the casserole is cooking you can go ahead and prepare your crackers for the topping. Melt the butter in a medium bowl. Place the crackers in a large zip top bag and seal. Use your hands to break the crackers into crumbs. No need to get more forceful than that, they break up easy! Can I Make Broccoli Casserole Ahead? Yes! I love making this ahead, especially when I have company coming! Prepare as directed in the recipe card, then cover tightly with foil and refrigerate. I recommend baking this within 24 hours of it being assembled for best results. A note, this serves about 6 people as a side dish. You can easily double the recipe and use a 9×13 inch baking dish for a bigger crowd. 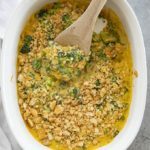 Classic Broccoli Casserole is a comfort food staple! This side dish is great or holiday's or weeknight meals. Full of fresh broccoli, cheese, and topped with Ritz! Preheat oven to 375 degrees. Grease a 2 quart baking dish with non-stick spray or butter and set aside. Bring a large pot of salted water to a boil, add the broccoli, reduce heat to medium and simmer for 3 minutes. Drain and set aside. While the broccoli is cooking, stir together the cream of chicken soup, mayonnaise, and seasonings, then whisk in the milk. Pour the soup mixture over the cooked and drained broccoli along with the cheese. Stir well to combine and pour into prepared dish. Melt the butter in a medium bowl. Place the crackers in a large zip top bag and seal. Break the crackers up in the bag using your hands. Stir the cracker crumbs into the butter until well combined. Remove the casserole from the oven, top with the buttered crackers then return to the oven and bake for 5 more minutes. Serve immediately. Store leftovers in the refrigerator for up to 3 days. **NOTE: You can use frozen broccoli that has been thawed in place of the fresh broccoli if desired. NOTE: To make this ahead, prepare as directed without the topping. Tightly cover with foil and refrigerate for up to 24 hours. Bake as directed. This looks absolutely delicious. It’s perfect side to a meat dinner. I love how you spiced this dish. This is definitely something I must prepare for my family. It’s light and super easy to make. I’m saving the recipe. 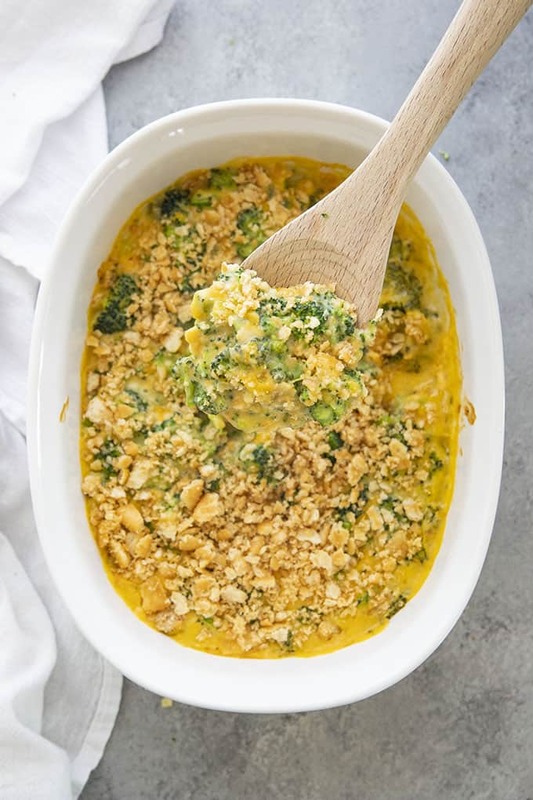 What a wonderful side dish for cheese and broccoli lovers. This dish would be a great side for Easter brunch. So here in the South, broccoli casserole typically comes with rice, but this is most definitely a rendition I could totally get down with! Broccoli and cheese is the perfect combo! Plus, it never hurts to ditch the rice a few months prior to summer 😉 Can’t wait to try! There is a reason this casserole is a classic — that’s because it’s so doggone good. People may not like broccoli by itself but make it into this casserole and there is nothing left. My mamma used to make this all the time and my kids loved it. I’ll have to make your recipe. A good broccoli casserole is sure a hard dish to beat! We still have a fairly cool spring in our little corner of the world, so I’ll definitely have to make this cozy sounding dish soon! What a great side dish! This will be a hit at Easter with my family! This looks like such a great veggie side dish – what a great way to celebrate your 3 year anniversary! Look forward to all your future recipes! Happy anniversary! Your blog is amazing and I love all your recipes. This particular one will be getting made on Easter. It is perfect for brunch or dinner. Happy anniversary! 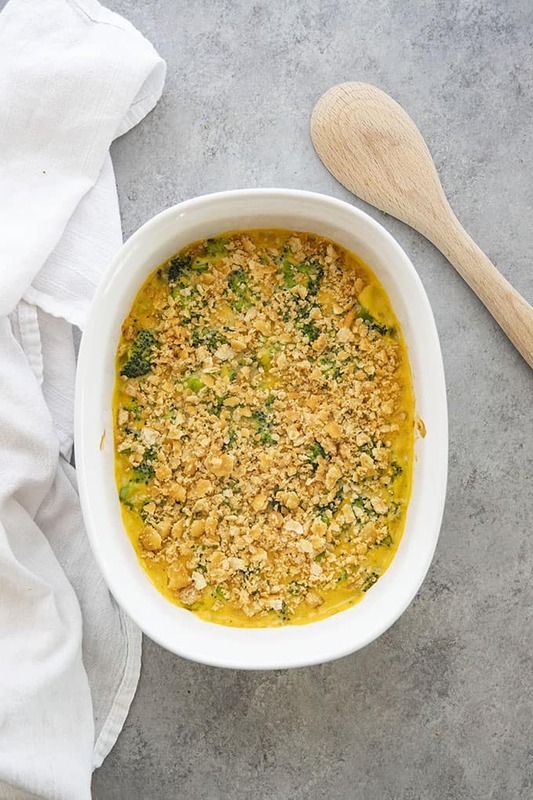 This broccoli casserole looks so delicious! I love a good vegetarian side dish and this looks so delicious that I could make a meal of it! I love making dishes like this for our meatless Mondays – so full of vegetables, but so rich and creamy that you don’t miss the meat! I am pinning this so I can give it a go, soon!